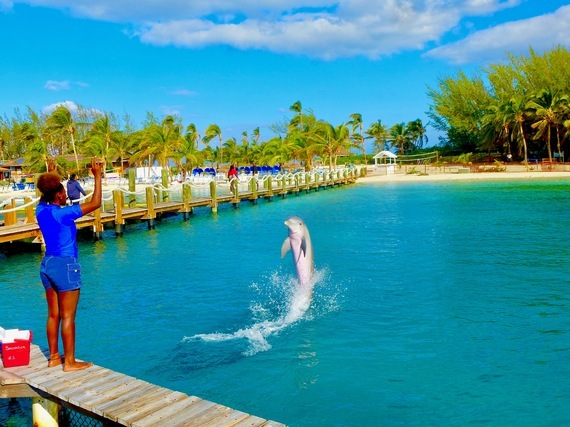 The Bahamas are an archipelago of 700 islands, situated 186 miles east of Miami. New Providence Island is home to the Bahamas' capital city, Nassau. In Nassau, gorgeous beaches are just the beginning. Rent a car, explore the surrounding island and you'll meet some of the 275,000 locals (of African, American and British descent) and experience their rich culture. Travel around and you'll return home with a heart-warming smile on your face that will last long into the cold winter months. Trainer and dolphin at Blue Lagoon Island, Nassau, Bahamas. Partying, playing, dining and traveling around. It's 82 degrees in Nassau! 1. Junkanoo -- Brazil has Carnival. New Orleans has Mardi Gras. Junkanoo is a street parade celebration that Bahamians similarly adore. The origins of the costumed tradition can be traced back to the Igbo people of Nigeria. Those festivities transitioned into three holidays around Christmas time that were granted to slaves by British law. Hints: 1.) Junkanoo parades are held on Boxing Day (December 26th), New Year's Day (January 1st) and in mid July, generally from 2am to 10am on downtown Bay Street. 2.) Cash prizes are awarded for best music, costumes and overall group presentation. 3.) Visit the intimate Educulture Junkanoo Museum for a personal tour. 2. Downtown - Cruise ships pull in near the downtown tourist section and government buildings. Bright, pastel-colored architecture and winding streets inundated with shops make buying anything from Cuban Cigars to Rolex watches at a huge discount an easy venture. Hints: 1.) Buy hand-made Bahamian straw hats, bags, toys, conch shell jewelry and woodcarvings at the Straw Market. 2.) Shop for jewelry, watches and designer duds at the Bay Street stores, save 25% off prices you'd pay in tghe U.S. and avoid sales tax! 3.) Go early. Shops close around 5pm, then the streets empty. 3. Blue Lagoon Island -- As you take the half-hour, double-decker boat ride to Blue Lagoon Island, an isle frequented by pirates in the 1800s and now a tourists' playground with a marine mammal sanctuary, you get panoramic views of the palatial Paradise Island, where mansions and yachts line its shore. When Blue Lagoon Island comes into view you see crystal clear turquoise waters, coconut palm tree-lined white powdered sand beaches and coral reefs. Take the kids. They'll love cavorting with the Atlantic Bottlenose dolphins, California sea lions and Southern stingrays. The jovial trainers make the encounters an experience to remember. Hints: 1.) Sail on the early-bird 8:30am boat and you'll miss the midday crowds and up your chances of having a one-on-one encounter with the dolphins. 2.) Lounge on the beach by the still, clear waters. 3.) The informative one-hour Segway Safari Tours glide by historic sites and include Bahamian island folklore. 4. Arawak Cay -- Ask locals where they go out to eat, and they'll point you in the direction of Arawak Cay, aka Fish Fry, a neighborhood off West Bay Street that's filled wall-to-wall with small cafes that cook and serve fresh fish. Prices are low and this is where you can mix with the Bahamians. What's the best restaurant? Let your nose and the amount of people filling the eatery be your guide. Don't be surprised if you wind up at Oh, Andros Fish Fry. The joint is packed with locals and American, British and Japanese travelers. Hints: 1.) Sip on a Kalik Beer, the local suds. The name comes from the sound a cowbell makes (Kaaaa-Liiiik). 2.) Order the combo platters of Grouper & Pork Chop or Snapper & Conch with a side of Rice and Peas and Plantains and the food will be piled miles-high on your plate. 3.) End dinner with the Guava Bread Pudding. 5. The Poop Deck East and West -- The original Poop Deck restaurant, the East one, located in Nassau's downtown harbor, opened in 1941. That fish café has blossomed into a full-fledged, upscale seafood restaurant with magnificent views of the waterfront. Two steps in the door you'll see a table with a bed of ice, displaying just-caught fish and lobster. There's also a Poop Deck in the Sandy Point neighborhood, often referred to as Poop Deck West. It's about a 30-minute drive along picturesque Bay Street. It offers a similar menu, has a more laid back feel, an extra touch of elegance and dramatic ocean views. Hints: 1.) At the East location, start with the Fish Cake with tangy tartar sauce, then go all in with the whole fried, flakey and moist Hogfish Snapper, surrounded by vegetables and garlic potatoes. Finish with Key Lime Pie. 2.) At the West location, begin the night with the Conch Fritters or the Citrus Grilled Shrimp, seasoned with island citrus & garlic. Move on to the Red Snapper filet and add sides: Bahamian Mac & Cheese, Peas N' Rice and Coleslaw. 3.) Smart travelers will eat in both restaurants and discuss the difference between the two over a couple of Kaliks. 6. Café Matisse -- Just off East Bay Street in a centuries old building, at the corner of Parliament Square where barristers walk around in black suits/robes with white bibs, sits the very classy Italian restaurant, Café Matisse. Its high-quality mix of Italian cuisine is as revered as the French paintings that adorn its walls. The main building is a small colonial-type cottage, and out back is an open-air courtyard with verdant foliage and tables filled with Nassau's most chic citizens. Lush interiors, attentive dining service and a very ambitious menu, the kind you'd see in a New York, Paris, or Milan restaurant, make Matisse a very sophisticated dining experience. 7. Drive around -- Yes, the downtown neighborhood on Bay Street in Nassau is a tourist mecca. But it is only one section of a very cool island that is worth seeing for yourself. Don't be intimidated by driving on the left side of the street. It's easy and you'll get the swing of it quickly. Road signs are relatively clear. The GPS on your smart phone will be helpful too. And when you stop for gas, something to eat or to visit a tourist site, you get to mingle with the locals. That's something that rarely happens from inside a tour bus. Hints: 1.) Drive west on Bay Street around the perimeter of the island, which is 21 miles long and seven miles wide. 2.) Head out to Cable Beach, on the northwest side of the island, which is lined with hotels. Swim, sun or jog around Goodman's Bay Park. 3.) At the end of your circular driving tour, head back downtown to the Queen's Staircase, a 102-ft., 65-step staircase that was carved out by slaves from limestone in 1793 and used as a shortcut to Fort Fincastle in case Nassau came under attack. 8. Nightlife -- Sun, swim and tour by day. Have fun at night. If gambling is your thing, throngs of vacationers take their chances at the Atlantis Casino with its 700 state-of-the-art slot machines and 85 gaming tables (baccarat, Texas Hold'em poker, craps, roulette and blackjack). Complimentary daily gaming lessons are available. 9. SuperClubs Breezes Resort & Spa -- This 391-room Super-Inclusive® resort on Cable Beach overlooking Delaport Bay has a homey feel. Prices are budget-friendly, all meals, drinks and most activities are included. The U-shaped building surrounds three swimming pools and a popular Jacuzzi and its rooms have a cabana feel. All guests are 14-years-old or over, so there are no crying babies. This is where you go when you want a very informal, adult-friendly, bohemian playground and prefer hanging out with a very multicultural clientele who also value an unpretentious, do-what-you-want atmosphere. This is very evident when night falls and folks gather in the main lobby to hear reggae and pop/soul bands play top forty hits. With no coaxing whatsoever the crowd gets up on the dance floor, moving their hips and feet around in total abandonment like they were auditioning for Dancing with the Stars--the cocktail-induced version. Others hang out at a piano bar that doesn't close until the last request. Hints: 1.) Take a lesson on the trapeze and swing through the air with the greatest of ease. 2.) Dino, the resident tennis pro, gives clinics and private lessons mornings and afternoons. 3.) Spa treatments on the beach are done in a hut that's private enough to cut out all stimulus and open enough to hear the waves crash on the shore. 10. Festivals/events -- You can have a great vacation in Nassau any time of year. But if you plan your trip right, you can come to the island for a festival or event that will make your travel experience even more enjoyable. The annual Bahamas Gospel Fest, sponsored by the Bahamas Ministry of Tourism and Coca Cola, is a four-day event that includes live performances, panels and worship services with international singers, clergy and celebrities. This year's closing night event was hosted by Cheryl Jackson from Praise 104.1 FM and featured the sweet pop-gospel vocals of the artist called Lyrically Blessed who sounds like The Weeknd. Hints: 1.) The Bahamas International Film Festival screens films from around the world. 2.) Popeyes Bahamas Bowl features America's best college football teams at Nassau's Thomas A. Robinson Stadium. 3.) Marathon Bahamas runs along an oceanfront route and also includes a half-marathon and a relay race. Visit travel writer Dwight Brown at DwightBrownInk.com.